For the very few of you who don't already know about him, we introduce to you - Dan Nainan! Dan, with a Japanese mother and Indian father, is a comedian renowned for his 100% clean humour. He has performed at such high profile venues as the Apollo Theather and for Hillary Clinton at the Democratic Convention. In his past, he was a senior engineer for Intel. Nainan traveled the world with CEO Andy Grove, demonstrating the latest technology on stage at high-profile events. In 2001, he left his job at Intel to pursue comedy full time. 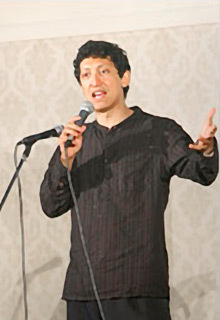 Nainan has been seen on NBC's Last Comic Standing and Saturday Night Live as well as on Nickelodeon and A&E. He has performed with some of the top comedians in the country such as Jerry Seinfeld, Bob Saget, Tim Conway and Garry Shandling. He has also done a variety of TV commercials and appeared on many radio stations around the US. His audience is diverse and his performances span charity and corporate functions, weddings, college, and political events. Besides performing for celebrities such as Hillary Clinton, he has also performed for Cherie Booth (Mrs. Tony Blair), congressman Mike Honda, Sanjay Gupta and Howard Dean.